Comprising a large restaurant, takeaway, cottage and some parcels of land, this property is to be sold in 1 or 4 individual lots. A high profile commercial property strategically located overlooking the pier in Kilronan on Inishmore, the largest of the Aran Islands. A very popular tourist spot, ‘An tSean Cheibh’ is perfectly positioned where the tourist traffic arrives on the island. A wonderful opportunity for the owner investor. AMV is €300,000 and VIEWINGS BY APPOINTMENT. Three storeys (1st, 2nd and 3rd floors ) of a very high profile mixed investment property. The ground floor is not included in the sale. Located in the heart of Galway city centre, this property has a double aspect, overlooking Mary Street and Francis Street. In good condition this property needs some upgrading and modernisation. VIEWING IS BY APPOINTMENT and the AMV: €295,000. City centre 3 bed mid terraced house, recently refurbished with new carpets, kitchen units and bathroom suites. The property is in good condition and ready to walk into and has a beautiful rear yard. Ideal as an owner occupier residence, holiday home or investment property with all year rental potential. OPEN VIEWING SATURDAYS 2.00 – 3.00 with an AMV: €250,000. A new entry to the autumn auction, this 3 bed semi-detached house has a two bed apartment to the rear. Located just walking distance of NUIG and UCHG it would make a great investment property being so close to all amenities and the city centre. OPEN VIEWINGS SATURDAYS 5.00 – 6.00 and an AMV: €260,000. Three bed semi-detached house located approx. 2 kms from NUIG and UCHG. Convenient to all main routes into Galway city and adjacent to Dunnes Stores and Tesco Shopping Centres. Another ideal first home or excellent investment property as this estate is always a popular rental location. OPEN VIEWINGS THURSDAYS & SATURDAYS 2.00 – 3.00 AND an AMV: €198,000. close proximity to NUIG, University hospital and within walking distance to the city centre. This property is of a considerable size and in good condition, offering the prospect of a beautiful family home in a well-established area of Galway or indeed a magnificent investment property, given the huge demand for lodgings for students and young professionals. Accommodation comprises 2 living, kit/dining, utility, guest wc, 5 beds, 2 ens, bath, study/bed 6 and a large rear yard. OPEN VIEWING THURSDAYS & SATURDAYS 3.30 – 4.30 with an AMV: €400,000. Four bed semi-detached in excellent decorative order. Located adjacent to GMIT and Flannery’s Hotel. Great investment property given its proximity to the college and the hospitals at Bon Secour, Merlin Park and Galway Clinic. OPEN VIEWINGS THURSDAYS & SATURDAYS 2.00 – 3.00 with an AMV: €240,000. Two superbly located 4 bed mid-terraced residences over 3 floors. Side by side and located within walking distance of NUIG, shopping centres and all local amenities. This is an ideal investment opportunity and is currently let for the student academic year 2016/2017. These student accommodations can be used by the owner throughout the summer months (June, July & August ). OPEN VIEWING SATURDAYS 2.00 – 3.00 with an AMV: €235,000 EACH. Two bed second floor apartment, not included in the pooled rental system. Within 5km of Galway City Centre, close to GMIT, within walking distance of all amenities and services and on an excellent bus route. Ideal starter home or investment property. OPEN VIEWING SATURDAYS 11:30 - 12:00 – AMV: €85,000. 208 Gleann Na Ri, Renmore, GalwayTwo bed first floor apartment of 970 sq.ft approx. Currently occupied in and a pooled rental system, generating gross rent of €700 per calendar month. Excellent investment property, being sold with tenants in place. OPEN VIEWING SATURDAYS 11.00 – 11.30 – AMV: €80,000. Ground floor retail unit with apartment overhead, being sold with tenants in place. Ground floor unit is currently in use as a barber's shop and generates rental income of approx. €433.00 per month. The occupied apartment overhead generates approx. €217.00 rental income per month. Ideal investment opportunity, being sold with tenants in place. OPEN VIEWING SUNDAYS 12:00 - 12:30 with an AMV: €40,000. Ground floor retail unit with 2 bed apartment overhead, located in the centre of Glenamaddy town. In need of extensive refurbishment. OPEN VIEWINGS SUNDAYS 1.30 – 2.15 with an AMV: €40,000. Spacious retail unit of 690 sq.ft approx., located in Tuam town centre. Only 30 minutes’ drive from Galway City. This property would make ideal retail or office space. OPEN VIEWINGS SUNDAYS 3.00 – 3.30 and an AMV: €50,000. Always a popular address, this modern first floor 2 bed apartment is located in the heart of Tuam town. It would make an ideal first home or an investment property. Annual management fees are approx. €750 and this property has OPEN VIEWINGS SUNDAYS 3.30 – 4.00 and comes to the market with an AMV: €68,000. Two semi-detached 3 bed houses on the main Galway/Mayo Road (N17 ). Very centrally located being just minutes’ walk from the town centre. These properties need full modernisation but would make a great development project for an owner occupier or investor. They both come with wide side access to very large rear yards. No. 8 has a huge garage to the rear, so there is plenty of storage. Well worth their AMV of €30,000 each and OPEN VIEWINGS SUNDAYS 4.15 – 5.15. 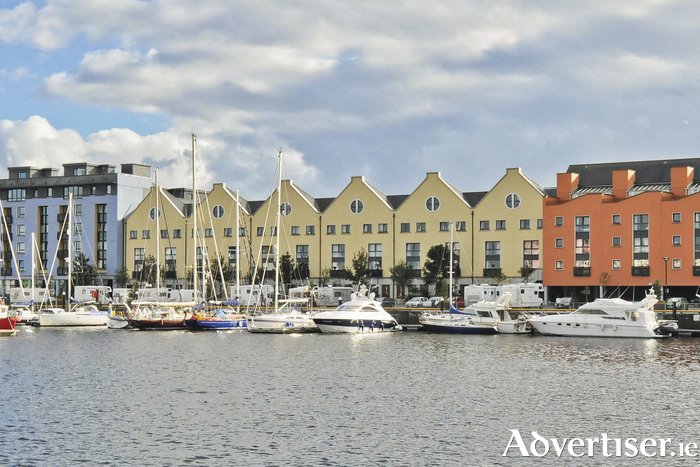 Spacious 4 bed townhouse ideally located in Galway city docklands and only moments’ walk from Quay Street with its selection of bars and restaurants. This property comes with 3 bathrooms and the development is well managed. Always a great investment location generating excellent rental income year round. OPEN VIEWINGS THURSDAYS & SATURDAYS 11.00 – 12.00 and an AMV of €250,000. For further information on any of these properties for auction, contact O’Donnellan & Joyce Auctioneers, 5 Mary Street, Galway on 091 564 212, www.odonnjoyce.com or email [email protected] .